Those of you who know me well know that I love people. I want to be friends with everyone I meet, and I do care what people think of me. I try to be honest, kind and service-oriented. If you need anything, I will do my very best to help, and if I can’t, I feel bad about it and want to make it up to you. I am not perfect, but if I do something wrong, I will apologize. The idea of someone thinking badly of me breaks my heart. I have many faults, but this is one area where I have strength. There have been a couple instances in my life where I have lost a friend. One I still don’t know why. I miss her and wish we could be friends again. I have reached out to her multiple times over the years without any type of explanation. It saddens me. In the other instance, I chose to end the friendship, at least temporarily. This person and I have been friends and have had great experiences together since we met several years ago. She said and did hurtful things multiple times in those years, but I always forgave her and moved on. However, a few months ago, she laid heavy accusations and unkind words at the feet of someone I love very much. This person was confused and upset by these accusations, and did not deserve them in any way. Due to this, I had to choose between one loved one and the other. I chose the one who was blameless, but said that if my friend would apologize and make things right, I would happily be her friend again. Unfortunately, since that time several months ago, this good friend of mine has said very unkind things about me on Facebook and to others. She has also contacted my husband many times with passive aggressive comments about me and my family. Most recently, she said that she forgave my loved one for what she did wrong. Perhaps this made me the most upset of all, as the whole reason why we stopped being friends is because she accused my loved one of doing something she absolutely did not do, and called her horrible names. I have tried very hard to forgive this person, and honestly, I want nothing more than to be her friend again. I love her, and I do think back to the wonderful interactions we have had, and the service we have rendered to one another. But, I can’t bring myself to be a friend with someone who thinks I am a hypocrite, talks about me behind my back, and continues to believe something about my loved one that isn’t true. Why am I telling you all this? Well, perhaps one of you have felt down-trodden due to something similar, where someone you care about has betrayed your friendship or trust, where someone puts hear-say or pride above truth and love. I feel for you. It is a horrible feeling. It is especially difficult when you cannot avoid that person’s presence. This whole situation eats at me, and I really want to make it right. Sometimes you can’t, though. When someone has made up her mind about you irrationally, what can you really do to change it? What I have to do is remember that the names I am called do not describe or define me. My conscience is clear and my intent true. I must defend what I know is right, and the ones I love. The Lord has commanded us to always forgive, and I will continue to forgive. This does not require me, however, to rebuild a relationship that will only cause harm to me. I felt that I must get this off my chest, and if any of my readers and friends needs to talk to someone about something similar, please feel free to contact me. I will do my best to listen and to reach out with love and encouragement. I do feel it is important for me not to condemn and judge this person with finality. I am still open to being her friend again, as I know that change can happen for anyone through the atonement of Christ. My door is always open if one chooses to knock gently. Each of us is a child of God and is of infinite value to Him. We all need friends and we all need love. 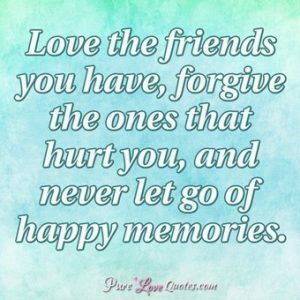 We must choose our friends wisely, and for those who hurt us, may we pray for them and wish them understanding, comfort, and a softened heart. To this friend, I say that I love you, and have never stopped. I am frustrated and hurt, but that can change if you wish it to. I feel the same way, We can forgive and love, but the relationship could stop in some situations. Great a blog my love.